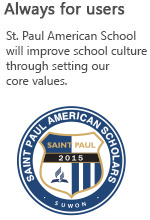 St. Paul American Scholars – Suwon! Thank you for visiting the website of our school community. SPAS began in the summer of 2015 as a small English immersion school offering an American style education. Over the past few years we have continued to grow, but our commitment to offering an exceptional education that strives for global mindedness, critical thinking, and mutual responsibility remains steadfast. We currently have 12 full and part time qualified and dedicated educators. All of our homeroom teachers are from the United States and Canada, with several years of teaching experience. They teach grades 1 ? 8, and are the backbone of our school. The students also learn Art, Music, and Physical Education, and Korean. All of the teachers have several years of teaching both in Korea and in North America in their respective fields. To help meet our goal of global mindedness SPAS also offers Chinese classes. Both of our Chinese teachers are native speaking highly qualified teachers from China. In addition to our exceptional educators, we have a wonderful Parent ? Teacher Organization that meets regularly to address the needs of both the parents and the school. At SPAS we recognize that education is a three legged stool; the teachers, the parents, and the students. The key to our growth and success is the strong level of parental support we receive. Once again, thank you for taking the time to visit our website to learn more about our exciting and engaging school community. At SPAS we recognize that for our children to be successful it is vital for them to have a global perspective on issues. Currently, nearly 30% of our students are international students. We recognize that this diversity of experiences, beliefs, and perspectives allows all of our students to have a deeper and richer understanding of many issues. SPAS believes that its small and intimate class sizes coupled with our strong diversity helps really set us apart, and makes our school community truly unique and special. St. Paul American School – Suwon is a Candidate for Accreditation. Approved by the Accrediting Commission for Schools, Western Association of Schools and Colleges.